eBooks with a Sound Track? …does anyone else think this sounds (sorry) doomed to fail? I’m all for new ways of experiencing stories but we’ve done pretty well with books, radio and TV / film. Each medium has its own strengths and for me, the attraction of a good book is that your imagination creates the world in your head. Now when I read that the door creaks open, I hear it too. Surely if I want a story with sound effects, I get an audio book? Maybe I’m being too critical. If you want to try it out, it’s available from the Apple App Store for the iPhone et al. There’s only five books available at the moment, two for adults and three for children. On reflection, children may well respond to this approach and it might encourage reading, so that changes my opinion a little. Great idea for kids, bad idea for adults. your cart or too your wish list. I did run into a couple of problems while attempting to download some books. Sometimes entering the zip code work and sometimes it didn’t and I would have to browse by state. The first time I downloaded a book I had to shut down and restart my iPhone before the book showed up on my list. I also noticed that the number of books available for download is limited. One of the reasons the number of books available are limited is because not all publishers offer their books to libraries. Some publishers are under the mistaken idea that libraries are stealing sales from them. “Public libraries are more important than some blogger,” said Potash from Overdrive. “The library is the best way to elevate your sales. The data is starting to prove it.” Unfortunately the one device that is not supported directly by Overdrive is the Kindle. Although it possible add ebooks downloaded from Overdrive to Kindle, it takes additional steps you have to be able to remove the DRM and convert to Mobipocket format. Clearly most people are not going to do this. Hopefully this is something that can be fixed, its unfortunate that library books can’t be downloaded to the most popular e-book reader easily. Despite these problems if you like to read ebooks or listen to audiobooks, try your local library on-line you maybe surprised what is available. Todd and Tom get together with Jerry Cimadomo and Greg Stetson of Ectaco to review their range of ebook readers and translators. First up was is the Jetbook Mini (shown right) at $99, which runs off 4 AAA batteries giving 90 hours of continuous reading. 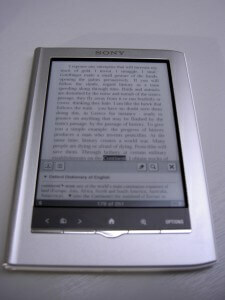 It comes with free software which converts a wide range of ebook formats into a one suitable for the device. Second was a new model that will be out in a couple of months. Aimed at the school market, it will come preloaded with a pile of educational material. It goes beyond being a simple ereader with features such as voice recognition so that language programs are able to give feedback on pronunciation. Around $250. Interview by Todd Cochrane of Geek News Central and Tom Newman of The Fogview Podcast. 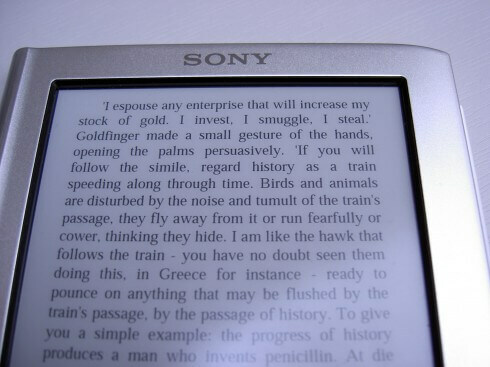 There’s no doubt that ebook readers are very much du jour, and Sony are keen to be part of that trend with the recent additions of the Touch and Pocket Editions to the Sony Reader line-up. Reviewed here is the Pocket Edition (PRS-350), which is the smaller of the two models, with a 5″ touch screen. Overall, it’s about 14.5 cm tall, 10.5 cm wide and only 9 mm deep. At this size it can go in a (big) coat pocket and fits easily into most handbags. As you can see from the pictures, it comes in silver, but pink and black are also available. It’s also very light at only 155 g.
The e Ink Pearl screen is common in ebook readers but if you’ve not seen or used one, there are a couple of defining features. First is that the letters on the screen appear to be on the surface of the screen. It’s not like a laptop or tablet where you know that you are looking through glass. Second the screen doesn’t flicker at all. Not a bit. Thirdly, text is very smooth – you have to look incredibly closely to see any pixellation or “jaggies”. Fourthly, there’s no backlight so you need external light to read. Finally, when you do turn a page, the screen briefly flickers into a negative image as it morphs from one page to the next. It’s a bit odd but you get used to it very quickly. In terms of the screen, I didn’t think that the Reader screen was any better or worse than any of the others that I’d seen. Admittedly I didn’t have a Kindle or Nook to hand to compare but all seemed normal and perfectly acceptable. Beneath the screen, there’s a small legend and a row of five buttons along the bottom for page back, forwards, home, zoom and options. Buttons were ok but there could have been a bit more feedback from them. Connectivity is limited to a micro-USB connection and the Reader appears as a removable drive. Consequently, all books have to be downloaded to a PC or laptop and then dropped into the folder. This is sometimes termed “sideloading” and while it’s not as convenient as wi-fi connectivity, it’s pretty idiot-proof and you’ve a backup copy of your books on your own computer. In use, the Pocket Reader is straightforward. Pressing the home button takes you to a screen which shows your current reading material. Having a touch screen means that most navigation can be done with by tapping on the screen, either with your finger or the included stylus, which slides into a silo on the righthand side. The device never responds quite as fast, as say, a PDA or mobile phone, but I think it’s just the nature of ebooks readers at the moment. Tapping on the option to see all the loaded books gives a list sorted by author, title and filename. Selecting the book will open up the title and let you start reading. The zoom button allows adjustment of the font size to five different sizes (XS through XL). I found that the “S” setting was about the best. To move through the book, you can either use the backwards and forwards buttons or else slide your finger on the screen to the turn the page. One cool feature was that double-tapping on a word brings up a dictionary and show the possible meanings of the word. Great for when you come across a word that you aren’t familiar with. In terms of formats, the Reader can handle epub, pdf and rtf natively. I found that epub and rtf formats worked best and that pdfs suffered when being resized to fit on the smaller screen. Even with epub files, there were huge variations in the quality of the books. Of course, this isn’t the fault of the Reader but rather a reflection on the ebook industry. EPUB-based ebooks are widely available from the likes of WHSmith and Waterstones but as Amazon uses a proprietary format, you can’t get ebooks from there. I had the Reader for just over a week and during that time I read a couple of novels and I never had to charge the battery after the initial charge. It charges through the USB connector so there’s no power brick included. I’d be confident that I could take this on holiday for two weeks and not have to worry. However, my biggest issue is….how do you hold the device? Being used to years of paperback reading with one hand I’m having to re-learn how to hold a book. Overall, I liked the Pocket Edition Reader. The Reader is small but the screen is clear. Battery life is excellent and there are plenty of ebooks available. Sony currently have the Pocket Edition on sale in the UK for £159 with the Touch Edition at £199. Thanks to Sony for providing the review unit. Andrew Marr, formerly the BBC’s Political Editor, has written a series of articles on the changing face of news and journalism in an era of technological change. In the second, A New Journalism on the Horizon, he talks in a little bit more detail about the media revolution, where he discusses the future of journalism in the age of new media. He starts out from the recent revelations that (a) the estimated readership of the The Times Online has dropped by 90% since the introduction of the paywall and (b) e-books are outstripping hardbacks on Amazon, and how these facts seem to be contra-indications. He puts forwards two points, the first being that the notion of not paying for news seems to be somewhat strange. People pay for DVDs, magazines, TV channels, mobile apps, e-books, so why not news? Although he’d be happy to pay, he wants to be able to pick and choose – politics but not fashion, business but not crime – so he feels the proposition will need to be refined. The second point is that there will undoubtedly be consolidation in the market for general news or the news of the day. But he believes that underneath this will be specialist news organisations that deal in particular sectors of the market, such as automotive, enviromental, foreign countries. This will be where the real knowledge and understanding will be. As ever, it’s hard to gaze into the crystal ball and predict the future. From my previous posts, you’ll know that I think we have to start paying for news if we want quality journalism to continue. As to the second point, of specialised news organisations, I think he’s right. Imagine CNN or the BBC no longer having a technology correspondent and outsourcing that to Engadget or Gizmodo. Or business news provided by the Economist. It’s not a hard stretch of the imagination to see that coming. What do you think? Will the news organisations of today simply become aggregators? 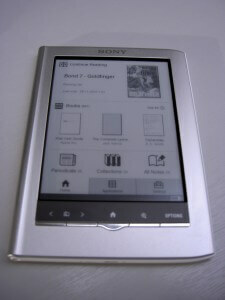 If the electronics industry has anything to do with it 2010 will be the year that the e-book finally gets off the ground. They’ve been kicking around for years – I remember reading stuff from Peanut Press on my Palm III back in the ’90s. Anyway, this isn’t going to be about e-books and their rise, but rather about a study into free e-books carried out by Jeff Hilton and David Wiley at Brigham Young University in the USA. In summary, they found that giving away free e-books resulted in higher sales of the printed copy. The study involved 41 books in four different categories and the sales figures were assessed over an eight week period. In three out of the four categories, sales increased where a free e-book version was made available. It’s not clear whether the titles chosen because they would generally appeal to digerati, who would presumably be the most likely to read e-books, or whether the titles were self-selected by being free. Most of the books were PDFs but a few came in other formats. Overall, sales of print books in three categories rose but in the fourth category, Tor sci-fi, there was a significant fall. This fall in sales is likely to do with the method of distribution. Each free e-book was only available for one week before the next one became available and the results were also skewed by one particular title which contributed to 65% of the fall on its own. The authors suggest a number of reasons why free e-books may lead to increases in print book sales but admit that it’s difficult to giving a convincing explanation. One might simply be the publicity around the free giveaway. It’s much easier to say why publishers give away free e-books. Tor wanted publicity for a new web site and Random House gave away free the first book of a series, presumably to entice readers into buying the subsequent novels. However, perhaps the comment that gives the most food for thought is simply that e-books are searchable. Not in the context of a single e-book on your e-book reader, but rather when on the web and indexed by a search engine, it makes low volume books more easily discoverable. This will translate into sales of the book that would simply not occur because the purchaser is unaware of the title in the first place. This should be sufficient in itself to encourage publishers to get digital copies on-line. The full paper is The Short Term Influence of Free Digital Versions of Books on Print Sales.